Sometimes the best meals come out using leftovers in the fridge. We had slim pickings in the fridge today, so I asked Marcus to make us something with them. He is so much better at that than I am. He came up with this Quinoa with Roasted Garlic and Potatoes. Before he started the recipe, I made sure to tell him to measure everything so I could share it with you all. It came out delicious. The roasted garlic adds such great flavor. If you like this recipe you may also like some of his other recipes. The most popular ones are, sweet potato chili, peanut noodle stir fry and 3 bean soup. This dish was so flavorful. The roasted garlic and potatoes were like buttery bites of heaven in the middle of the quinoa and chickpeas. 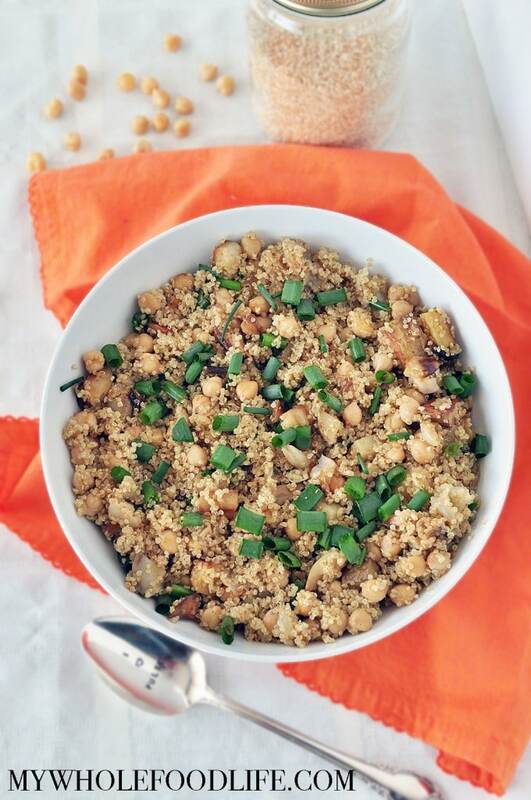 This Quinoa with Roasted Garlic and Potatoes is vegan and gluten free. Roasting the garlic and potatoes adds such great flavor! Put the garlic, potatoes, onions, and oil in a large glass baking dish and roast potatoes for 40-50 minutes taking time to stir the mixture at least once. Take the roasted veggies out of the oven after they are done, and mix every thing together salting to taste. If we had them, we would have added green peas to this as well. The flavors would have went very well together. If you decide to add green peas, just mix them in at the end. This should last at least 5 days in the fridge. Enjoy! Yum! I just love potatoes, I have some in the pven roasting now! :) Great idea to addthem to chickpeas and quinoa, that's a combo I have yet to try. Lovely! I love quinoa and potatoes. What a great combo. Lots of protein with the addition of the garbanzos. Just lovely! Mmmm that looks delicious. It's some of my favorite things mixed together! Reading this recipe made me so hungry. I have a feeling I will be at the store early tomorrow morning to buy these ingredients!!!! Thanks for sharing!!! Thanks Tracy! I hope you enjoy it. I had intended this as a side for another main protein because I didn't have any chickpeas but when my main dish wasn't cooked in time, I added a can of cannellini beans and served it alongside steamed sugar snap peas. I also added a large parsnip to roast with the potatoes and onions and garlic. It was all very delicious! I'm glad you enjoyed it Patrice! I like the addition of parsnip too! Hello there. I am looking forward to trying this recipe out later this week!!! Are we supposed to chop the garlic up at all though? Thanks! Really enjoying your blog so far btw! Thank you Elizabeth! So glad you are enjoying the recipes! For the chick peas, do I just pour in the canned chickpeas at the end? I think I'm going to have to make this recipe for my boyfriend. He loves potatoes so this sounds like a perfect introduction to quinoa for him! I'm not sure what on earth everyone else made but I went by the recipe and this dish was boring and bland. I'm sorry but it was seriously in need of salt and other spices...was not impressed.